Nestled in the Sonoran Desert, the University of Arizona is home to the Graduate Planning Society, also known as GPS. Our GPS coordinates are 32°14’8.22”N 110°57’14.80”W, and our mission is to support students’ academic, professional, and personal growth. GPS is the University of Arizona’s APA-affiliated Planning Student Organization (PSO). Our PSO provides opportunities for students to engage in community events; pursue personal interests; and engage with planning professionals at the local, state, and national levels throughout the year. Our formula for success is constantly evolving but our goals and priorities are always rooted in the student. Here are some strategies that our PSO has found to be successful. The purpose of the Graduate Planning Society is to provide students in the University of Arizona’s Planning Program with the support and professional tools necessary to develop leadership skills, advocate for excellence in community planning, promote education and citizen empowerment, and provide the tools and support necessary to meet the challenges of growth and change. It’s a mouthful but that’s our mission, and it is vital to how our governing board appropriates funds for socials and extra curricular activities in the community. Ultimately, every PSO needs a mission statement that ensures they are accountable to a certain standard. We make it a point to convene and involve students in social gatherings. This helps to encourage peer engagement and a better understanding of our diverse backgrounds and interests. These events often give rise to animated discussions helping us to appreciate one another’s strengths, weaknesses, and differences. 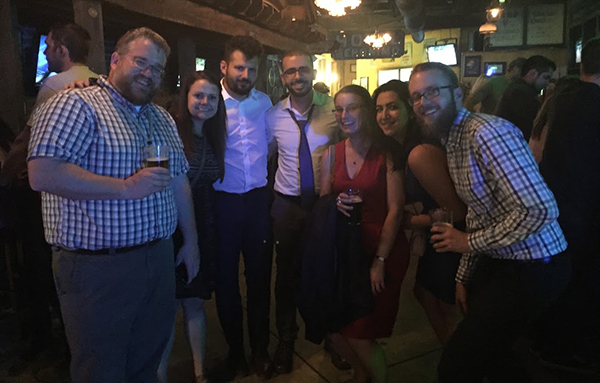 These GPS socials have helped our organization grow into a tight knit group beyond the siloed groups of first year and second year cohorts. As a result, we push each other academically and continually expand our professional networks. 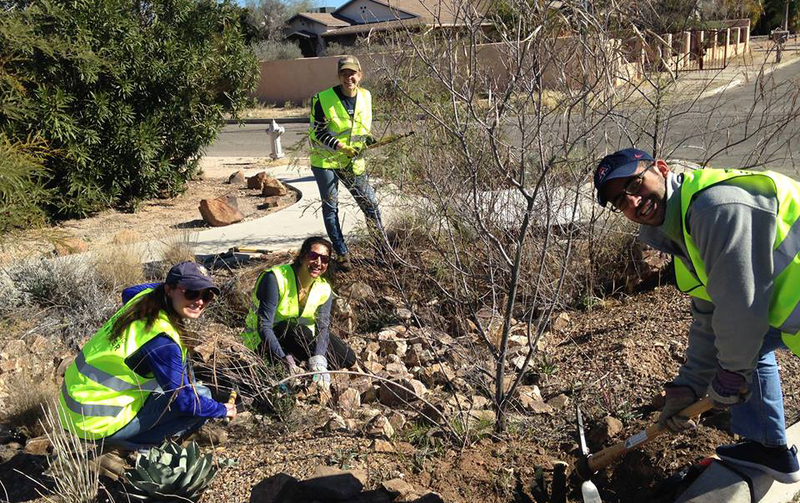 Community Work Day with Trees for Tucson in the Rincon Heights neighborhood. Photo courtesy Graduate Planning Society. 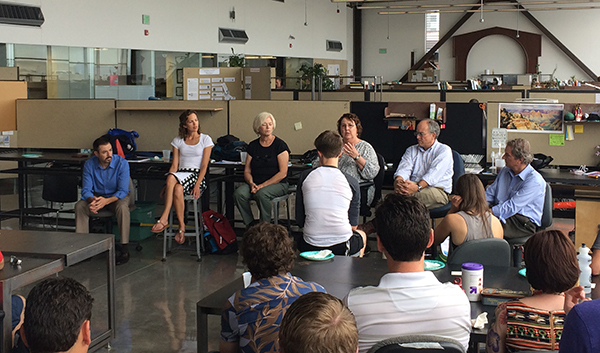 Friends of Planning, a 501(c)(3) nonprofit, was formed by urban planning professionals in the Tucson area to help ensure the strength and longevity of the graduate planning degree program at the University of Arizona. Through financial contributions and shared expertise, the Friends of Planning provide scholarship funds and student awards. In addition, Friends of Planning offers mentorship and “office hours” to graduate planning students helping us to expand our planning horizons and professional networks. We encourage students to pursue leadership roles as student representatives with our local, state and national APA boards. Student liaisons to these APA boards learn what is going on in the planning world and bring that information back to GPS to share during our meetings. It is also a great way to make personal relationships with planners that often lead to both formal and informal mentorship opportunities. Understanding the resources available from each chapter has been an important aspect to GPS’s success. Participate as much as possible and don’t be afraid to ask for help or guidance! By developing a fundraising strategy, we are able to ensure that our goals would come to fruition. The result is a multi-faceted approach to fundraising that keeps our PSO coffers flush so we can sponsor some costs for GPS members to attend APA conferences. We sell GPS merchandise such as t-shirts and bumper stickers, and hold bake sales to cash in on people’s sweet tooth. We have also explored percentage nights at local restaurants, pubs, and bowling alleys. We regularly apply for grants from the university and get great support from our community. Percentage Night at La Cocina. Photo courtesy Graduate Planning Society. These points have helped to create opportunities for students at the University of Arizona pursue research, engage in personal and professional growth, and be exposed to the planning profession. They are constantly evolving and require the collaborative consensus building of your cohort and department to ensure its success. We encourage all to THINK BIG, have fun, and enjoy this time! Thomas Lampo, Chris Ortiz y Pino, and Ian Wan are graduate planning students at the University of Arizona, pursuing Master of Science in Planning degrees. Top image: Students with Wilma the Wildcat at the 2015 APA-Arizona State Conference at the University of Arizona. Photo courtesy Graduate Planning Society.